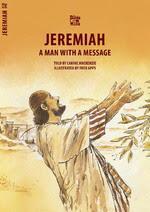 A Man With A Message follows the difficult life of Jeremiah, who was chosen by God to give the message of destruction to the people of God. Bible Wise series. Colour illustrations throughout.